Erhard Busek has been entitled as Ad Personam Jean Monnet Chair: Transforamtion and Stabilization in South East Europe - European Integration. Dr Busek will act as main teaching person (Ad personam Jean Monnet Chair), as well as main academic coordinator responsible for scientific and teaching (training) contents of this project. 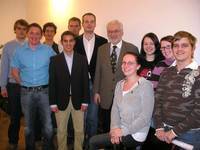 Dr Erhard Busek will give regular courses and, as also done in the past, he will pass his enourmos knowledge and experience as political practitioner and one of the key players in the European integration, to students, young researchers and interested public. He will also define educative contents, prepare teaching material and provide training tools. In the scope of the practical training, meetings of students with top politicians, experts and representatives of various political bodies will be organised. Also training visits of students to the European institutions in Brussels will be undertaken under the coach of Dr Busek. Based on his experiences of the European development before 1989, Erhard Busek can give an "insider" overview about the dissidence movements on the other side of the Iron Curtain, because he was deeply involved in supporting Solidarnosc, Charta 77, Magyar Demokrata Forum and other democratic movement. Especially the representatives of the civil society in the outgoing communist systems gave him an overview about the beginning of the transformation processes. On behalf of the Austrian government (as Minister for Science and Research and Minister for Education between 1989 and 1995) Erhard Busek gave an essential support to the transition process using the platform of Universities, Research and NGOs. As a representative for EU-Enlargement of the Austrian Government between 2000 and 2002 he had the possibility to negotiate with the candidate countries of the enlargement process of 2004, but also to support them on their way to the European Union. He also established a kind of personal network which was not only on the political and working level. For further details, please see "About Erhard Busek"